Leaks from your air conditioner can wreak all kinds of havoc in your home. You are here: Home / HVAC Info & Articles / Articles / Why (and What) is My Air Conditioner Leaking? Why (and What) is My Air Conditioner Leaking? If your air conditioner seems to be leaking, you probably have a lot of questions. Why is it leaking? What is leaking from it? What should I do? Rest assured that leaks are quite common and it’s likely an easy fix. But if you see excessive moisture coming from your air conditioner you should definitely call an HVAC service in Greensboro to come and take a look. What is the Liquid that’s Leaking from my Air Conditioner? Most likely it is just water from condensation. As warm air moves over the cold evaporator coil, condensation or water forms. This water is supposed to go outside through a drainage system when your air conditioner is working right. When it isn’t, the water ends up inside underneath the AC unit. In some cases, your system may leak refrigerant. It can be difficult to tell the difference between a water leak and a refrigerant leak. The common signs of a refrigerant leak include ice on your outdoor unit or on the evaporator coil, warm air coming from your vents, and sometimes a lack of airflow in general. If any of these symptoms accompany your leak, there’s a good chance it’s not just water. If your AC is leaking water, it is likely because the drainage tube is blocked in some way so that water isn’t getting out like it should. It could also mean that the drain pan or drainage tube is cracked, causing water to leak. It could be that a malfunction of your system is causing excess moisture to build up faster than it can be drained out. Your air conditioner also works as a dehumidifier for your home during hot, humid summers. If you notice that your home feels more humid than it should like if windows fog up when it’s hot outside, it indicates that your AC is not working properly. You could prevent a leak before it starts if you pay attention to the early warning signs. Air conditioners leak refrigerant if there is a crack or hole in the evaporator coil. Strange as it seems, a lack of refrigerant can cause ice to form on the coil or the outside of the AC unit. When you’re sure the water is coming from your air conditioner and not your plumbing or elsewhere, you should contact your HVAC service in Greensboro. Rely on the experts at Berico to accurately diagnose the problem and repair it properly. The same thing applies if you suspect your system is leaking refrigerant. The coil will need to be repaired or replaced and recharged with the proper amount of refrigerant, which is a job for a trained HVAC technician. How can I Prevent Leaks Before they Start? Yearly maintenance for your air conditioner can prevent leaks and other problems from ever happening. Avoid water damage to your home from water and refrigerant leaks by having your system inspected, cleaned, and repaired every spring before the weather gets hot. Berico offers maintenance contracts that include AC and furnace maintenance along with other perks like discounted repairs and priority service. A Comfort and Protection Service Plan from Berico keeps your entire HVAC system (furnace and air conditioner) working efficiently throughout the year, keeping your home comfortable in any weather. Take the most important step in preventing heating and cooling problems. Call for Berico HVAC service in Greensboro: (336) 273-8663.
https://www.berico.com/wp-content/uploads/2018/12/header-logo-new-3a.png 0 0 Team Berico https://www.berico.com/wp-content/uploads/2018/12/header-logo-new-3a.png Team Berico2018-05-20 20:57:232018-05-30 13:39:56Why (and What) is My Air Conditioner Leaking? 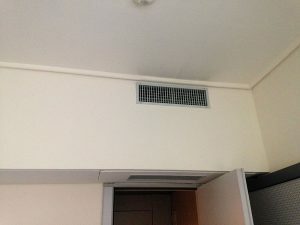 What to do if Your Air Conditioner Ices Over Could your Air Conditioner be Causing your Cough?